Ollivierre made the call on September 2 at Heritage Square, just one day short of the anniversary of her daughterâs death back in 2010. Kellishaw was one of six women who died as a result of the firebombing of the Campus Trends store on Tudor Street, Barbados, on September 3, 2010. 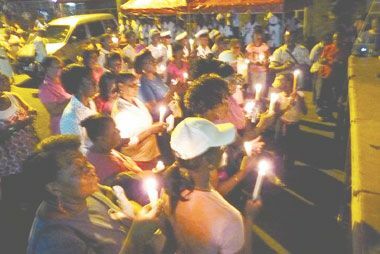 In remembrance of the young women, persons marched from the Peace Memorial Hall and converged at Heritage Square, where a rally was held in memory of victims of crime. Speaking at the gathering, Olivierre said we can make a difference by telling our young men and women that we must seek peace. âCrime is not the answer. There is a better way. We need to be more of an example as our neighbourâs keeper, looking out for one another,â Ollivierre urged. Ollivierre encouraged parents, especially fathers, to take the time to get to get more involved in their childrenâs lives. â We need our fathers to spend time with their sons and love them…take the family to church. That is where God wants you to be, not on the block or in the rum shop…,â she further implored. While reminiscing about Kellishaw, Ollivierre could not stop the tears from flowing. She described her daughter as being full of ambition, and said last year August, Kellishaw had promised that she would open a business and both of them would work together. Sadly, those dreams went up in flames. âWe have to send a message to the nation to let them know we can make a change,â Ollivierre added. Delivering brief remarks, Minister of National Reconciliation Maxwell Charles said the thing that pains society the most is not so much when the guilty die, but when innocent citizens suffer at the hands of criminals. Like Ollivierre, Charles also implored persons to learn to settle their differences amicably. Unity Labour Party (ULP) caretaker for East Kingstown Luke Browne said no matter how difficult times are, we should use every challenge we face as an opportunity to share the word of the Lord to our brothers and sisters. Browne stated that more good examples should be seen for young men and women to follow. âWe are not going to condemn them or ridicule them. We are going to instruct them and show them a good example,â Browne noted. Other remarks came from Silma McLean of the National Council of Women, Pastor Carmalie Daniel and Kellishawâs cousin Leron May.